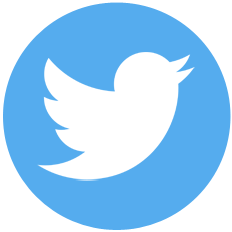 Twitter announced several significant changes in their terms of service (TOS). The new Twitter rules impact all users and social media automation tools and will be enforced starting March 23th, 2018. We will explain what’s changing and how the new Twitter rules will impact your social media marketing and scheduling practice. And, we will also show you what you can do about it. To make sure our users are in compliance with the new Twitter policies, we will also be introducing a couple of adjustments we have applied and will continue to apply to Blog2Social. However, we will make sure to provide you with many great features for your Twitter marketing in accordance with the new Twitter rules, now and in the future. This is why Twitter is placing a couple of new limitations on what users are allowed to do when using social media automation tools for auto-posting and scheduling. Enforcing these limitations, Twitter means to eliminate messages sent by fraudulent bots. However, these limitations will impact all Twitter accounts. This means, many common and effective marketing practices are no longer allowed, even if they rely on totally legitimate Twitter users and legitimate contents. So please make sure to familiarize yourself with the new rules and follow them carefully. By violating the new Twitter rules you risk that Twitter will suspend or even close your account. If you manage more than one Twitter account, it can make sense to share your content across all your accounts. However, with the enforcement of the new rules, Twitter will restrict accounts in posting the same or even substantially similar original content to multiple accounts. This limitation applies regardless of whether the Tweets are published at the same time, or are scheduled for future publication. How will the new Twitter rules affect social media automation? “Do not (and do not allow your users to) simultaneously post identical or substantially similar content to multiple accounts. For example, your service should not permit a user to select several accounts they control from which to publish a given Tweet. So all serious social media automation tools will no longer allow you to post the same content on multiple Twitter accounts. 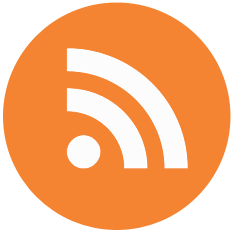 While Twitter continues to permit cross-posting outside information (such RSS feeds) to Twitter using automation, you should only post this content to one account you control. 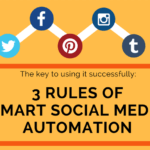 Another common practice in social media automation is the to perform actions such as Likes or Retweets across multiple accounts. Regardless of the new Twitter rules, the use of social media automation to share and schedule tweets will stay common practice in social media marketing and management. 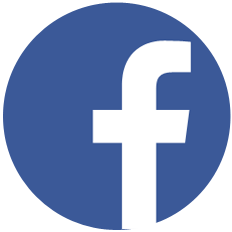 However, the focus will shift from cross-posting to cross-promotion on social media. The new Twitter rules are aimed at disarming fraudulent bots and fake accounts in the first place. But they will also impact those publishers who have several valid Twitter accounts or publish content to several valid Twitter accounts. The restrictions make sense for a SPAM-free Twitter universe and a better user experience. But they will also force all individuals and brands to re-think their Twitter marketing strategy. 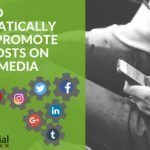 So what does this new policy mean for your social media marketing and the use of social media automation tools? Quality content will ultimately win the game, on any social network. Learn about 15 Killer Tactics to boost your engagement on Twitter. While many social media tools simply no longer allow users to select multiple Twitter accounts for posting, Blog2Social will provide you with a whole bunch of features for doing so in accordance with the new Twitter rules. We originally built Blog2Social for tailoring social media messages as a key feature. And this is what we are still specializing in. 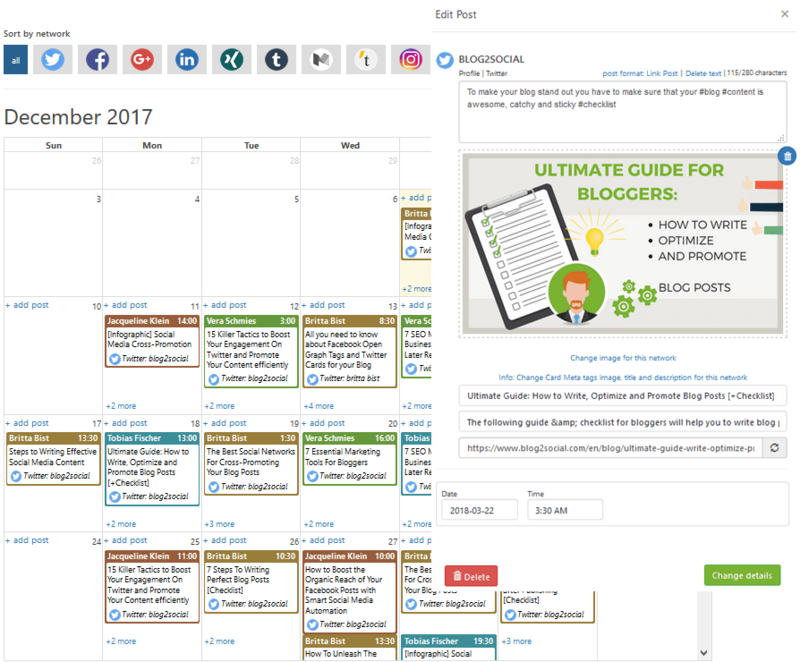 With the “Customizing & Scheduling” option Blog2Social enables you to add individual comments, selecting images and post formats, and even edit meta tags for your Twitter Cards. With these options, you can fully customize your tweets for each Twitter account and still automate the process of scheduling and sharing. If using the Auto-Poster option or import RSS feeds for auto-posting, you can select your primary Twitter account. You can still recycle your tweets as retweets to your other Twitter accounts, using different comments and hashtags. 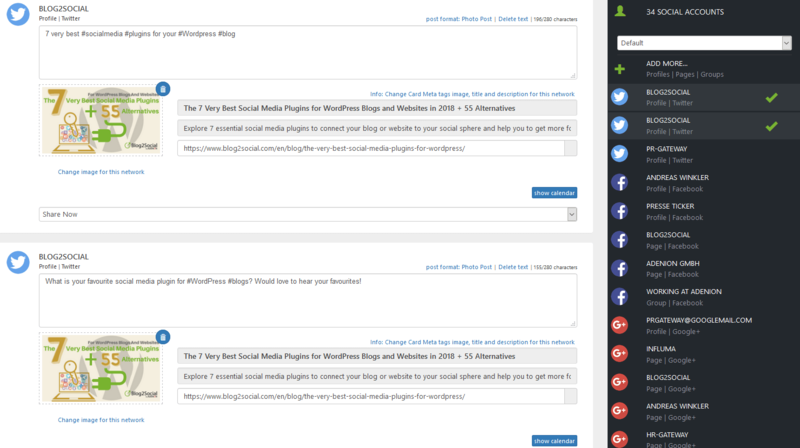 We will refine this options with the upcoming Blog2Social releases. By using the Blog2Social link shortener we currently vary your existing tweets automatically. However, this is not a bombproof solution to automatically generating individual tweets and will not work in the long term. We still recommend to varying your comments individually for each of your tweets. Spinning hashtags is another option for varying tweets. So if you‘re using multiple tags and keywords in your blog post, Blog2Social will automatically include these hashtags in your Tweet. By changing places and vary hashtags in your tweets this provides multiple options for diversifying your tweets for reposting. 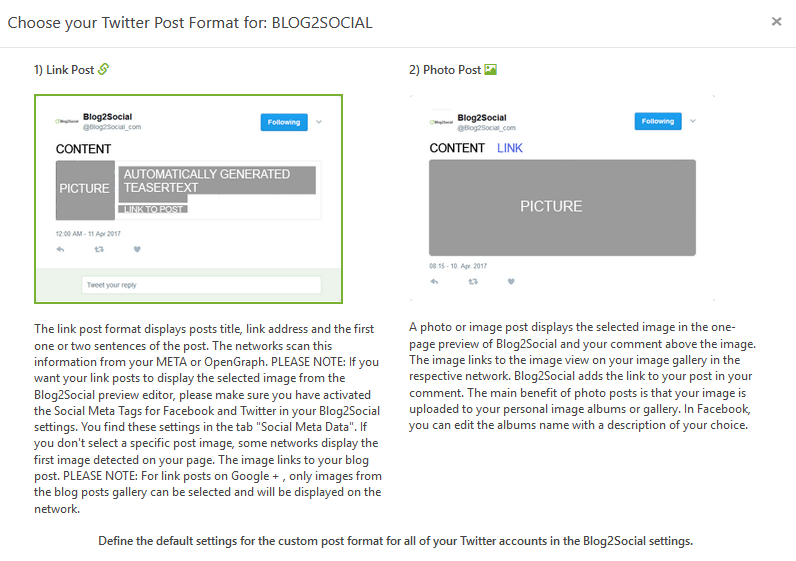 However, with Blog2Social you can very easily vary and customize your tweets by adding individual comments, selecting individual images and post formats, and even changing your Twitter Card meta tags. 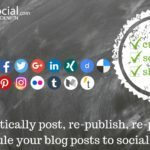 If you are ready to go, just click “share” and Blog2Social will share your tweets with an automatic delay mode to prevent mass posting, or at your scheduled times. An image post tweet clearly focuses on the image. The image tweet enables your followers to view your photos or infographics right in their feed. 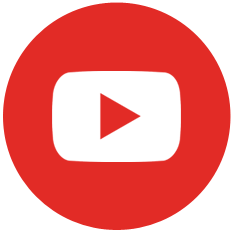 All images from your image posts are automatically uploaded to your Twitter media gallery. So, your followers can still find your graphics even if your tweet has long vanished ways down in your stream. A link post tweet generates an automatic preview and forwards your followers straight to your website as soon as they click. To do so, simply go to “Settings” in your Blog2Social dashboard and select the tab “Network Settings”. 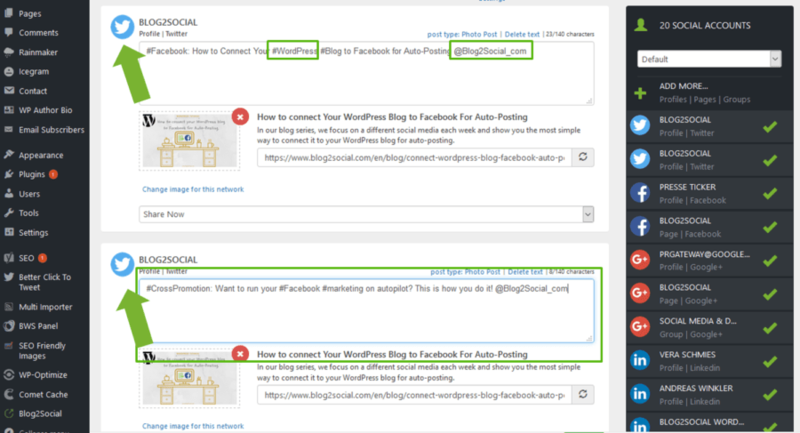 Here you can select whether you want to share your blog posts with a link preview or as an image tweet. Your images tweets will automatically contain the link to your website. You can select the post format as default setting. You can also select to change the post format for each individual tweet on the preview editor. If you know which times work best for you, you can also save your own preferred times as Best Time Settings. You can then automatically schedule and share your tweets according to your custom time settings. 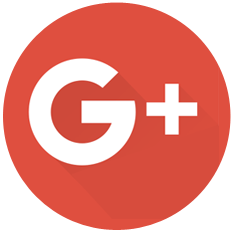 FAQ Why do I have to update Blog2Social to 4.7? The new Twitter rules will provide many headaches for social media marketers. But they will provide a better Twitter universe for all of us. However, it is most probably that other networks will follow the lead, simply to prevent bots from moving on. So, expect to hear from other networks enforcing similar rules and regulations pretty soon. We will keep you updated on current events and adopt any changes to Blog2Social. However, there are still multiple options to share and reshare and schedule your content on Twitter. 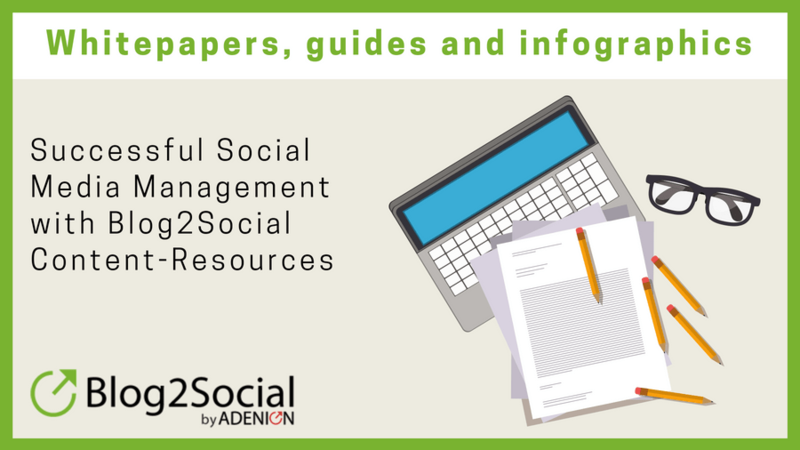 Blog2Social will always support your activities with as much automation and as much individualization as possible for marketing your content successfully across multiple social platforms. Now over to you. What do you think of the new Twitter rules regulations? Do you think they make sense or do you think Twitter is overreacting and overstretching all common sense? 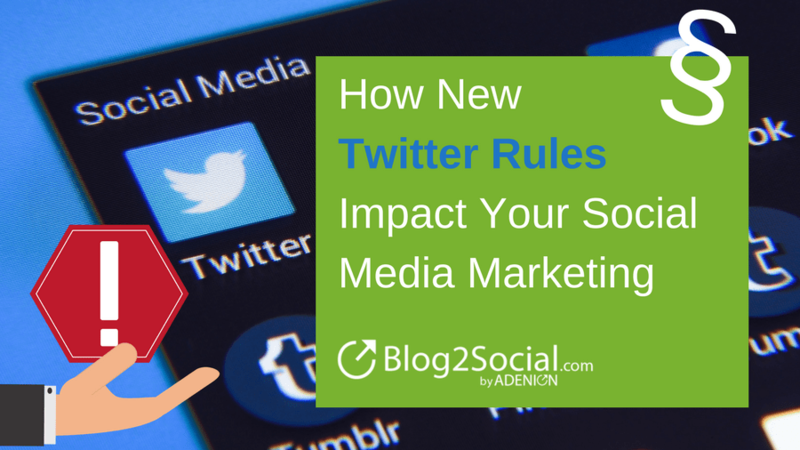 How will the new Twitter rules change your social media marketing? Are you moving along or giving up in despair? Let us know what you think? You’re right – you’re definitely on the safe side with a single Twitter account. With multiple accounts, you have to be even more careful and make sure to create and share a different copy each time you share a new blog post. There is a problem with Blog2Social Set up. Please check… There is this Twitter Notice that just pops ups and locks the screen. There is no button to remove it. I don’t know if am the only one facing the challenge. But it needs your attention. I have tried to change gadgets but nothing is happening. I want to be using blog2Social as I always do and if others are facing the same problem, then you need to check it up. Please. Could you please write me a short email to customer-service(at)blog2social(dot)com with a screenshot of the pop up that locks the screen? 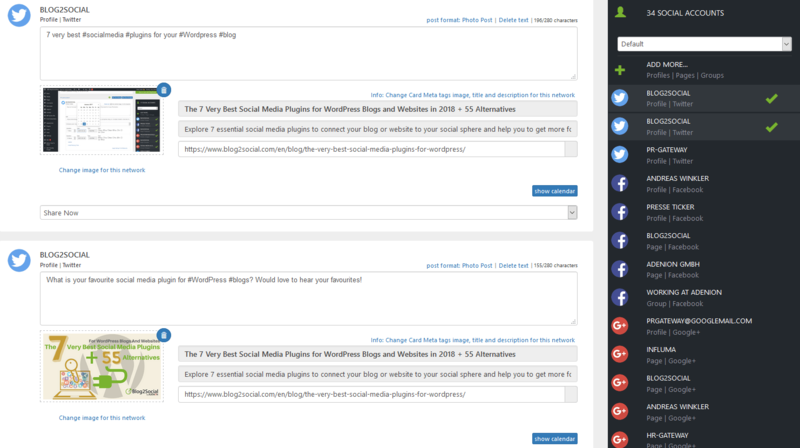 Which version of Blog2Social is currently active on your website? Thank you for your feedback. We are glad to hear that you like our blog post.